Email marketing has been our specialty since 2003. We may not have invented best practices but we know what they are, implement them with every campaign we create, and we advise do-it-yourselfers to do the same! This list will help both experienced and novice email marketers. Whether you're looking to get started on the right track or improve the effectiveness of your current email program, you'll benefit from this quick-read resource. 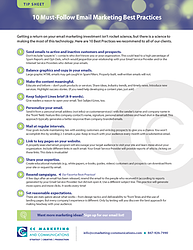 Download 10 Must-Follow Email Marketing Best Practices today!